I’ve had the immense pleasure of interacting with Andrea Zuvich, author of The Stuart Vampire through social media. I read her other book, His Last Mistress, last year, and I thoroughly enjoyed it. 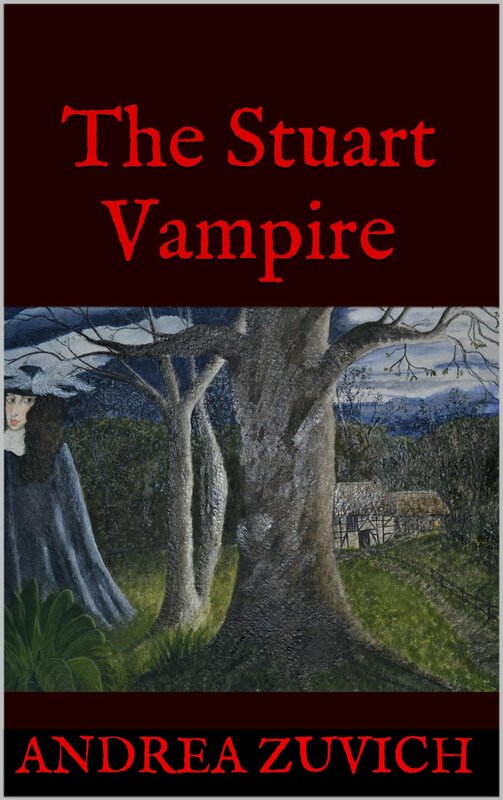 So when offered the chance to read and review The Stuart Vampire, I jumped at it. So I am pleased to offer a short review of it! The story starts in a tavern, with an odd couple telling their unbelievable story to a reporter. The man claims to be the long dead Henry Stuart, Duke of Gloucester, and his wife. However, Henry died in 1660 of smallpox and was buried in Westminster Abbey. Or did he? Henry states that the night he died, he was visited by a Vampiress, Griselda, who turned the Duke from a life of splendor at the court of his brother, King Charles II, to being a servant of darkness. Griselda is happy to be a concubine of the devil, but is looking for a companion to live out the ages with. Henry is reluctant to accept and tries to fight back against his new dark life. From there, he wrestles with the demon within him as Griselda is summoned to a council of Vampire elders to answer for her actions. Henry is then left to grow accustomed to his new body, while he discovers the sad lives of a forgotten village. The author runs a successful blog and Facebook page, The Seventeenth Century Lady , and specializes in the Stuart family. Her knowledge of the period and the family really shines through. Andrea has a deep passion for this area of history, and it shows in the details. She is able to reference both the places and historical figures that the characters would have interacted with, including cameos by children of Charles II and England’s own Witchfinder General. I’m not big on historical fiction these days, as I usually find the real stories to be much more engaging. That being said, I enjoyed the book. It was a short read, as I finished it in just a couple days. A tad of a guilty pleasure for me, as I’m mostly into NF these days (except for A Song of Ice and Fire series, sue me). If you’re interested, you should know that it is a vampire story, so there is blood and death; however I found none of it to be gratuitous. There is a little bit of romance, too, for those of us who are hopeless lovers. In short, I would recommend this book for those of you who enjoy a good story with a scary element; or a good read on the Stuart family. “The Stuart Vampire” by Andrea Zuvich is available for Kindle through Amazon US and UK. You can also check her site, http://www.andreazuvich.com, for more on the fascinating 17th century!